Who Sets American Exchange Rate Policy? Stagnant Incomes for the Middle Class? A reader posed a question in a comment on an earlier post: "LeMonde today had a long op-ed on the European reponse to the high Euro and in it the author claimed that "La politique de change americaine est du seul ressort de la Maison Blanche, la Fed n'ayant pas son mot a dire sur le sujet." (Exchange rate policy is a White House resort only, the Fed does not say a thing about this). This confuses me. I thought interest rates were the main leverage of nations to impact exchange rates and those are clearly left to the Fed. So how can the White House be responsible for the exchange rate if they cannot regulate it in anyway?" This is a good question; the short answer is that the Treasury and the Fed have separate authority to engage in foreign exchange market intervention. Treasury (executive branch) appears to have the upper hand. Yet, the Fed also has legal authority over interest rates. Practically speaking, then, the question of who controls exchange rate policy depends upon whether forex intervention is an effective instrument. As most economists seem to agree that it is not (which is why the US rarely engages in forex intervention), then practical authority would seem to lie with the Fed via their control of interest rates. It is not altogether clear who has final say in the event of a conflict between exchange rate and domestic monetary objectives--can the Treasury force the Fed to expand the money supply to depreciate the dollar? Can the Fed force the Treasury to accept a dollar value in order to achieve its domestic monetary goals? I think that exchange rate policy in the euro zone is similarly ambiguous; the ECB controls monetary policy while the Council of Ministers has the authority to set broad exchange rate objectives. What happens, who has ultimate authority, when they conflict is unclear. (on the ECB and Council, see here, Article 109). By law and custom, the Secretary of the Treasury is primarily and directly responsible to the President and the Congress for formulating and defending U.S. domestic and international economic policy, assessing the position of the United States in the world economy, and conducting international negotiations on these matters. At the same time, foreign exchange markets are closely linked to money markets and to questions of monetary policy that are within the purview of the Federal Reserve. There is a distinct role and responsibility for the Federal Reserve,working with the Treasury and in cooperation with foreign central banks that operate in their own markets. For many years, the Treasury and the Federal Reserve have recognized the need to cooperate in the formulation and implementation of exchange rate policy. The Treasury and the Federal Reserve each have independent legal authority to intervene in the foreign exchange market. Since 1978, the financing of U.S. exchange market operations has generally been shared between the two. Intervention by the Treasury is authorized by the Gold Reserve Act of 1934 and the Bretton Woods Agreements Act of 1944. Intervention by the Federal Reserve System is authorized by the Federal Reserve Act. It is clear that the Treasury cannot commit Federal Reserve funds to intervention operations. It also is clear that any foreign exchange operations of the Federal Reserve will be conducted,in the words of the Federal Open Market Committee (FOMC),“in close and continuous cooperation with the United States Treasury.” In practice, any differences between the Treasury and the Federal Reserve on these matters have generally been worked out satisfactorily. Cooperation is facilitated by the fact that all U.S.foreign exchange market operations are conducted by the Foreign Exchange Desk of the Federal Reserve Bank of New York, acting as agent for both the Treasury and the Federal Reserve System. Interesting factoid of the day: "There are considerably fewer cabs in Paris today than there were in the 1920s, because of strict limits on new licences set by the drivers themselves." Why, you might ask, are there fewer taxis today than in the 1920s? It turns out, to drive a taxi you need a license. If you want a free license to drive a taxi in Paris, you will have to wait for 17 years. If you are the impatient sort, then you can put up $263,000 to purchase a license today. Why, you might ask, is it so costly to attain a license to drive a taxi in France? Because taxi drivers are unionized. France's reformers say that getting rid of the costly licenses would create 150,000 new jobs. The head of the taxi union, Alain Estival, is not enthusiastic; cab drivers "already saved France once when Paris' taxis brought troops to the front in the First World War -- they're not going to sacrifice themselves again to save the French economy." According to some, such as Jacques Delpla, an economist on the commission established to help Sarkozy identify barriers to growth in France, the taxi problem is symbolic of the bigger French problem: you have to pay for working. And once you do, you have strong incentive to prevent any change to the rules of the game. Common wisdom tells us that incomes for "the rest" have failed to rise much in the last thirty years, while incomes for the lowest quintile have actually lost ground. Recent research by Terry J. Fitzgerald, senior economist at the Minneapolis Fed, questions this common wisdom and reaches some quite different conclusions. In a nutshell, Fitzgerald finds that "labor income per hour for middle America has not stagnated. Rather, the economic compensation for work for middle Americans has risen significantly over the past 30 years." It seems that the conclusion one reaches about real income growth rest heavily upon what price deflator one employs and how one treats non-wage benefits. If one uses a consistent deflator and includes non-wage fringe benefits as part of compensation, real hourly wages have risen by 25 to 30 percent since 1975. Not huge gains over thirty years, but also not consistent with the commonly-state claim that incomes are falling. Sometimes life is serendipitous. 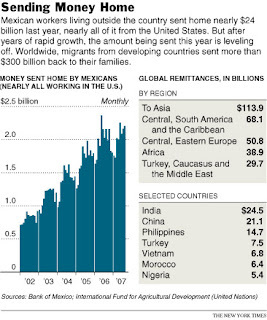 The issue of remittances arose in class yesterday, and this morning the Times has a long article on just this issue. Two points are interesting. First, according to Times figures, remittances to developing countries total more than $300 billion per year. Total official development assistance (foreign aid) peaked at $130 billion in 2005. Second, the Times suggests that the current US effort to stem inward migration from Mexico is slowing the flow of remittances from the US to Mexico. It strikes me that this is likely to have perverse consequences. Squeezing remittances will reduce disposable income in the households that had been benefiting from these transfers. As their income falls, many more might try to move across the border, thereby creating additional migration. Moreover, as the border patrol cracks down on migration, the carrying trade becomes seedier. "As tighter security makes crossing the border trickier and more hazardous, the traditional mom-and-pop operations in Mexico that used to ferry people across have been replaced by larger, more-professional criminal gangs, often with ties to the illegal drug trade." To summarize, the crack down on migration stems remittances, increases poverty and migration, and fuels criminal activity. This is not good policy. I am sorry for my sporadic posting this past ten days. I have been busy making final preparations for my wedding (which is tomorrow). I return to work Thursday, October 25, and will resume a posting thereafter. So, as the dollar weakens and the euro strengthens, an interesting dilemma arises. The Americans remain strangely quiet, happy about the dollar's depreciation but not trumpeting the fact. The Europeans are divided about what to do. The French want the European Central Bank to take steps to weaken the euro; other European officials celebrate the strong euro. "France has complained loudly in recent weeks about the strength of the euro, with clear support from Italy, but Germany, the world's top exporter, kept its distance. German Finance Minister Peer Steinbrueck did so again as the ministers convened on Monday, telling journalists as he entered the Luxembourg meeting: "I prefer a strong euro." His Dutch and Austrian colleagues took a similar line." Unable to agree upon a policy for the euro, it seems they decided to pressure China. "At a meeting dominated by worries about the strength of the euro, Jean-Claude Juncker, who is chairman of the group of euro zone finance ministers, described the concerns of the officials as being "first point, China; second point, dollar; third point, yen." Thus, unable to agree on coordinated management of the dollar-euro rate, look for the US and the EU to agree to gang up on China at the forthcoming G-7 conference. Don't travel from Durham, NC to Trondheim, Norway and back in four days unless you have one of these. 44 hours on planes, in airports, and in transit to and from airports. Eight separate flights; two canceled flights; three hour-plus delays. 34 hours in Trondheim. 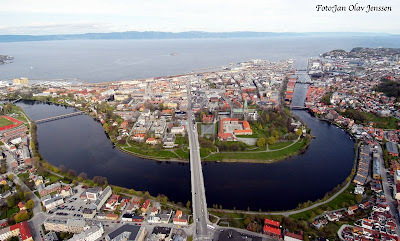 I'm off for a long weekend in chilly Trondheim, Norway. I'll post if I have time and internet access. Back on Wednesday. Twenty years ago, developing countries were highly skeptical about participation in the global economy while western nations were enthusiastic participants. Now, it appears, as developing countries become increasingly supportive, western nations (especially the U.S.) become more uncertain. "[A] survey of more than 45,000 people in 47 countries this past spring found large majorities everywhere saying trade was a good thing, particularly in countries lifted lately by trade-based growth, like Jordan and Argentina." (Click the image to the right for summary findings; Find the full survey here). "But recent years have seen erosion in support for trade in advanced Western countries including Germany, Britain, France and Italy — and most sharply in the United States." This is broadly consistent with the Stolper-Samuelson theorem's core prediction: abundant factors (developing country workers) gain from and support trade; scarce factors (western labor) lose from and oppose trade. Can it be as simple as that? A puzzle: how can Americans be more favorable to free markets than to free trade (see the chart)? Posted by Thomas Oatley at 3:41 PM . Thomas Friedman writes in today's New York Times about Toyota NA's efforts to block higher fuel efficiency standards now being considered in Congress. Friedman joins environmental groups in dismay that "Toyota, which pioneered the industry-leading, 50-miles-per-gallon Prius hybrid, has joined with the Big Three U.S. automakers in lobbying against the tougher mileage standards in the Senate version of the draft energy bill." He also thinks he knows why: "Now why would Toyota, which has used the Prius to brand itself as the greenest car company, pull such a stunt? Is it because Toyota wants to slow down innovation in Detroit on more energy efficient vehicles, which Toyota already dominates, while also keeping mileage room to build giant pickup trucks, like the Toyota Tundra, at the gas-guzzler end of the U.S. market?" One thing I find odd about this is Friedman's implicit assumption that better fuel efficiency by Detroit requires legislated standards, yet simultaneous recognition that Toyota has developed hybrids that beat existing standards. Ergo, innovation has occurred in the absence of and seems to be independent of legislation. The bigger problem is that Friedman is wrong about why Toyota is lobbying against the proposed regulations. He seems to suggest that Toyota is engaged in activity intended to discourage American producers from "innovating" in order to retain their advantage (using existing technology, e.g., hybrids, is not innovating, by the way, but that's beside the point). There seems a much simpler and less conspiratorial explanation: Toyota is trying to protect the return on the assets it holds in the United States. Friedman seems to assume that Toyota is one company with a unified balance sheet. That's probably not the right way to look at it. Toyota NA is a subsidiary of Toyota Motor, and as such has a distinct set of productive assets based in the U.S.. Toyota NA's assets (i.e., the plants located in the US) are engaged in the production of cars and light trucks and SUVs. By my simple calculations, each year Toyota produces 361,000 trucks and SUVs in its American plants against 367,000 Camrys and Corollas. About one-third of the Camrys are 6 cylinder, and very few are hybrids. This distribution of production is sufficient to meet current standards: lower-mileage trucks are offset by higher-mileage cars; on average they meet fleet standards. Sharply increasing fuel efficiency standards will force Toyota to reduce the relative importance of trucks/SUVs to smaller cars in its US production. This is costly. Either some assets now engaged in truck production must be redeployed (at positive cost) or Toyota must make new investments in small car production in the US. Both are costly for Toyota. All else being equal, therefore, Toyota's American assets will earn a higher return without the regulation than with the proposed regulation. In short, Toyota NA joins Detroit in opposition to the higher proposed standards because its US production structure looks a lot like "American" producers when it comes to the distribution of its productive assets across car and truck production. This is hardly surprising, given that all auto producers have built what Americans have wanted to buy (large inefficient SUVs). Consequently, Toyota's regulatory preferences are quite similar to Detroit's. Finally, is Toyota's position treasonous to the environmental cause it supposedly champions? Friedman seems to think so (the title, after all, is Et tu, Toyota?). Yet, although the Prius may be green, Toyota did not produce it because it was green. Toyota built the Prius because it believed many people would buy it, and as a consequence it could make money. It turns out they were right. Hence, the factors that now motivate Toyota's resistance to proposed fuel economy regulations are the very ones that led them to produce the Prius. This is not treason; it's business. On the eve of the new NHL season, I focus on two of my favorite things: hockey and exchange rates in order to consider how the U.S. dollar's recent slide against the Canadian dollar will shape competition in this season's NHL. For those who do not follow pro hockey, Canadian teams have struggled with the triple (quadruple?) burden of being small market (and thus limited earnings), of playing a substantial share of their games in the U.S., and thus having to pay for many of their expenses in US dollars*, needing to pay salaries that are on par with those paid by American franchises, and finally, doing so with a currency that was weak relative to its southern namesake. Lest you think this silly, notice that the last time that a Canadian team won the Cup (the Montreal Canadiens in 1992-93) came at the tail end of the previous strong loonie era. Admittedly, this exchange rate theory of Stanley Cup winners breaks down in the mid-1980s, a period that features a weak loonie and a dominant Edmonton Oilers team. Call this the Gretzky exception. But, as Gretzky is an outlier on every hockey dimension (they don't call him "the Great One" for nothing), I hardly think this anomaly undermines my theory. Thus, I confidently predict that a Canadian team will win the cup this year. Which one? My money is on the Canadiens.